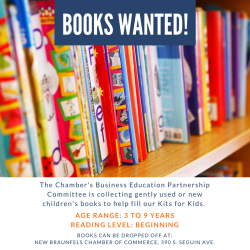 The Chamber’s Business-Education Partnership committee is collecting children’s books to be used in their “Kits for Kids”. These Kits will be distributed to area agencies and schools just prior to the holiday break in December. The “Kits for Kids” program is in its 10th year and has distributed more than 5,000 bags. The purpose of the program is to encourage families with pre-school aged children to read as a family at home. Books that are for early childhood through 4th grade are ideal. In addition to the books, other items included in the Kits are a parenting guide published by the State of Texas, public library information and application for a library card, helpful nutrition hints from the New Braunfels Food Bank, and a Comal County Resource Guide prepared by Connections. The Chamber will be collecting books from now through December 13. For more information about the “Kits for Kids” program or where to drop off books, contact Rusty Brockman at (830) 625-2385.